This Sunday marks six weeks to go until Big Lunch day 2017! We're getting very excited at Big Lunch HQ so thought we'd put together a handy how-to guide for the next few weeks that will help you to make The Big Lunch 2017 and The Great Get Together weekend the best community celebration the UK has ever seen! You can hold a Big Lunch anywhere: a park, your street, the village hall – even your back garden! 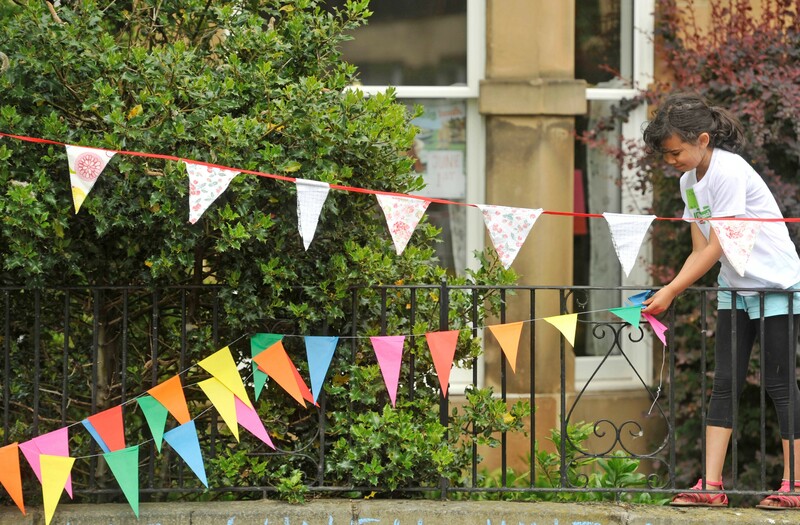 Councils can be lenient with road closure applications but some can require a lot of notice, so if you want to hold a Big Lunch street party and have yet to apply, get your skates on and contact them as soon as you can! For all venues make sure you get the relevant permission and remember that you are responsible for whatever happens there on Big Lunch day. 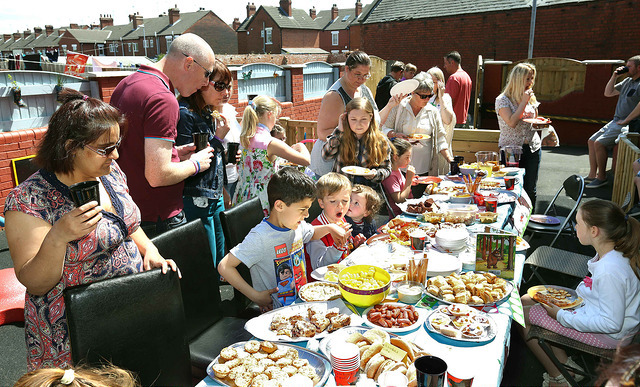 Make sure to check out the Department for Communities and Local Government’s latest advice on holding street parties, including some handy myth busters! People are the most important part of a Big Lunch, so head out armed with your pack invitations and start knocking on doors! We know it can be daunting, especially if you don’t know your neighbours at all, but we hear so many stories of people who were so grateful that one of their neighbours had taken the plunge! Perhaps others want to get involved too and you could form an organising committee? Don’t forget you can also use tools like Facebook and Twitter to invite people, and try to get RSVPs to keep track of numbers. You get invites in our free packs, or you can print out more if you need to. The next step is thinking about what kind of day you want to have! Are you going to have a themed event or any enterainment? Think about what resources you already have in your community that you could draw on. Maybe a DJ who lives down the road who could sort out music for the day, or a neighbour who has a face painting kit? Perhaps a local community group would like to perform or offer their services at your Big Lunch? Our communities are goldmines of talent and resources so why not make the most of them? Now you know how many people are attending and what kind of event you are holding, it’s a good time to have a think about the inevitably unpredictable UK weather and put some contingency plans in place! We’ve had a few rainy Big Lunch days but this doesn’t mean you have to stop the fun! Armed with wellies and rain macs, a Big Lunch in the park can be great fun! 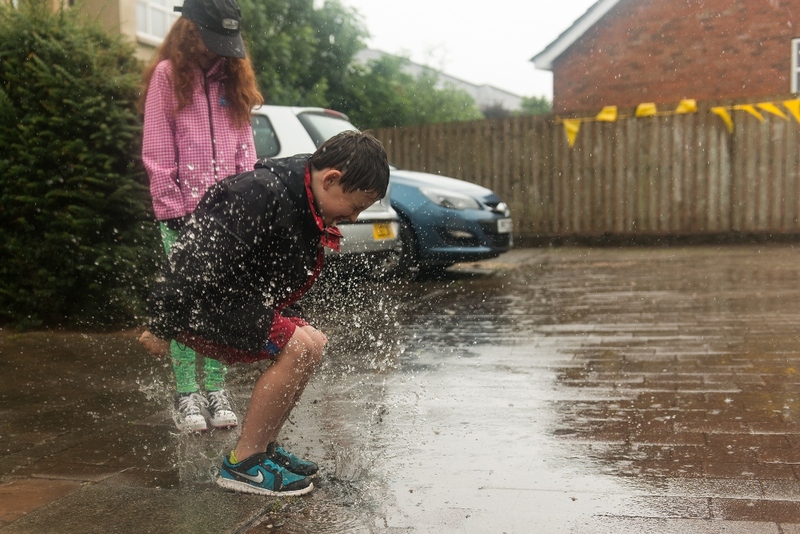 Have a look at some of our wet weather Big Lunch ideas. The same goes for hot weather – remind everyone to bring suncream and make sure to have plenty of water and shade available if you will be outside. Decorations don’t have to be fancy or costly, half the fun is in the making! 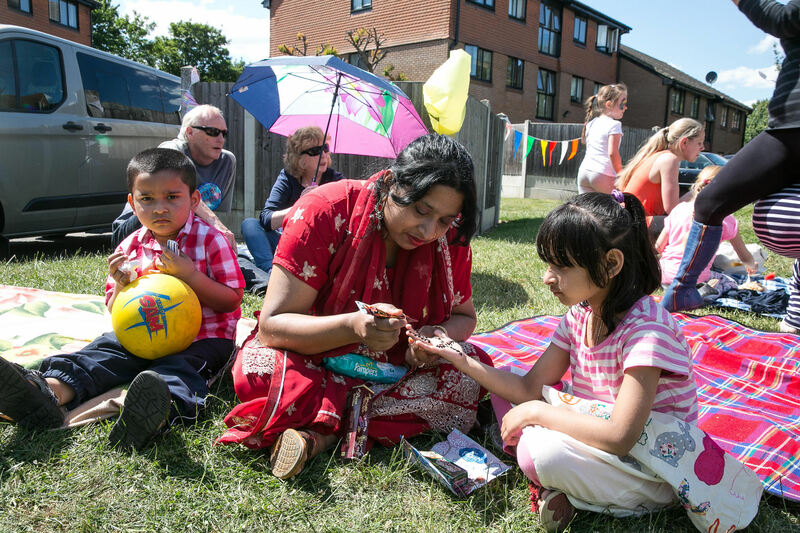 Bunting, tablecloths and paper chains can all be made at home and are a great way to get children together and involved in The Big Lunch. If you have children why not ask a teacher if they could make some decorations in art class? Don’t be afraid to ask people to bring tables and chairs – many people have old garden furniture that could use a little love! Now’s also a good time to gather any materials you might need for games and activities you’ve got planned! It’s time to make your Big Lunch delicious! We’ve done studies that show how important eating together is, so now it’s time to put this into action. Keep cost and waste down by asking everyone to bring a dish to share. One Big Luncher told us that on her street the odd numbers bring sweet dishes and the even numbers bring savoury – easy peasy! Make sure that everyone’s preparing their food hygienically and that any food containing allergens is properly labelled. Check out some tasty recipes too. The Big Lunch is nigh! Pop up some extra posters around your neighbourhood to remind people that The Big Lunch is next weekend, or get creative with some chalk action. And don’t forget to check the weather forecast for Big Lunch day. If rain is on the horizon get your brollies ready, and if the day promises sunshine grab your suncream and smile at our luck! By now you should be well and truly raring to go so sit back, relax and feel the community spirit take over! 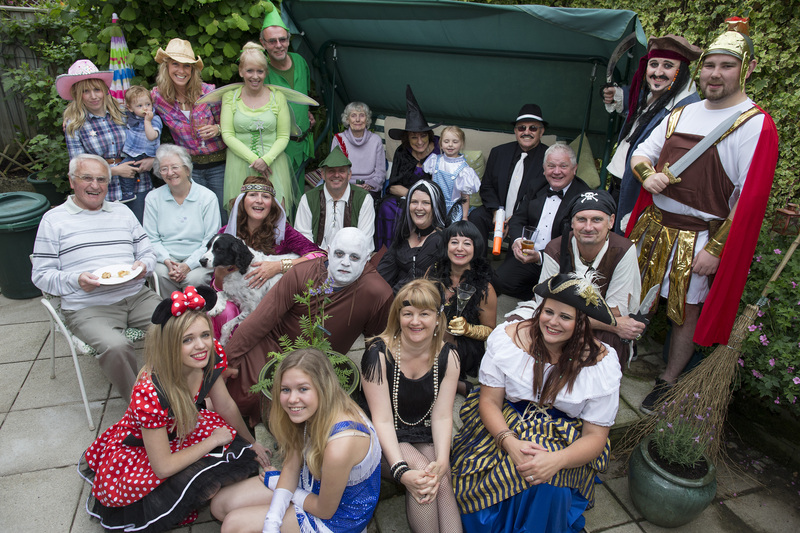 Take plenty of photos, eat plenty of food and share stories with the people around you – the perfect Big Lunch day! There’s still plenty of time to get involved with The Big Lunch – order your free Big Lunch pack here! We have learnt that people want to come together, they just need a little bit of encouragement!